Kepler-78b shouldn't exist. An Earth-sized planet with a rocky surface and an iron core, Kepler-78b is so close to its parent star that it completes an orbital revolution every 8.5 hours. Kepler-78b is a curiosity because scientists have no way of explaining how the lava world could have formed given its proximity to its parent star. Kepler-78b may be an exoplanet notable for being approximately Earth-sized and likely possessing a rocky surface plus iron core, but that’s where any similarity to our planet ends. It has an extremely tight orbit around sun-like star Kepler-78, completing one ‘year’ in only 8.5 hours. It orbits so close in fact that the alien world’s surface temperature soars to 2,000 degrees hotter than Earth’s. 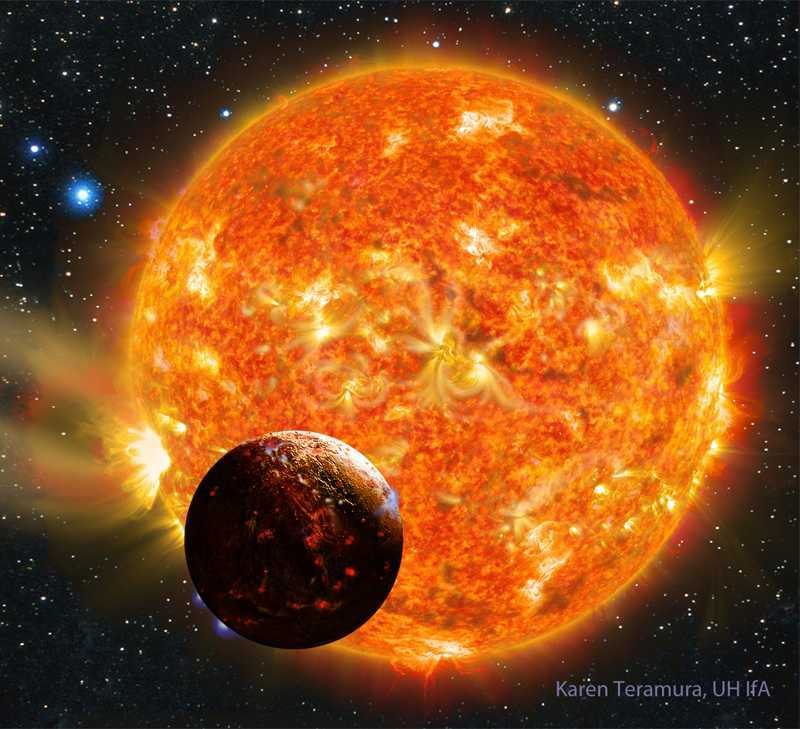 Referring to Kepler-78b as a “rocky” world is therefore a misnomer — it’s a hellish lava world. 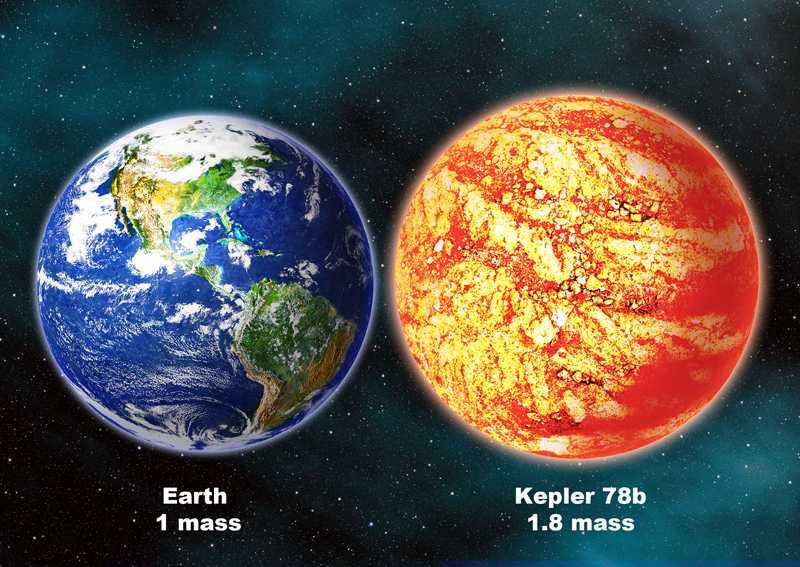 But this is just a side-show to the real conundrum behind Kepler-78b: It shouldn’t exist at all. To current planetary formation theories, this lava world is an abomination. There’s no physical way a small world, only 20 percent larger than Earth, could have evolved in that location and there’s no known mechanism that could have transported it there. 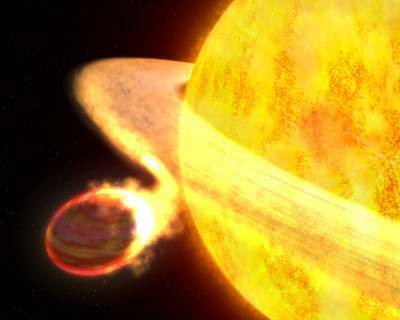 But one thing that is certain, it can’t stay roasting in that hellish orbit for long; it’s destined to get swallowed by its star “very soon, astronomically speaking,” said Dimitar Sasselov, also a CfA astronomer. However, for a world that shouldn’t exist, its life expectancy is pretty generous. Astronomers reckon that Kepler-78b will succumb to the star’s tidal stresses and get ripped apart in about 3 billion years time. When Kepler-78, which is located around 400 light-years away in the constellation Cygnus, was in the early stages of stellar development it would have been much larger than it is now. When astronomers calculated how big the young star would have been, Kepler-78b would be orbiting inside the star. “It couldn’t have formed in place because you can’t form a planet inside a star,” said Sasselov. So could the planet have formed in a wider orbit and migrated inward? This is another improbability, say the researchers. “It couldn’t have formed further out and migrated inward, because it would have migrated all the way into the star. This planet is an enigma,” Sasselov added. Despite its mysterious nature, Kepler-78b isn’t alone. The world represents a new class of exoplanets recently discovered by NASA’s Kepler Space Telescope. These worlds are small (approaching Earth-sized) with very compact orbits of less than 12 hours, but Kepler-78b is the first of this class to have its mass and density measured. “Kepler-78b is the poster child for this new class of planets,” said Latham. Although Kepler originally detected Kepler-78b, the team used data from the high-precision spectrometer HARPS-North at the Roque de los Muchachos Observatory on La Palma and coordinated with a second, independent team using the HIRES spectrograph at the Keck Observatory, Hawaii. Whereas Kepler detects exoplanetary “transits” — as a world passes in front of its star, Kepler detects a slight dip in brightness — ground-based spectrometers measure the “wobble” of a star that is being gravitationally tugged by an orbiting world. A transit can be used to gain a measure of the physical size of the exoplanet, but the “radial velocity method” is required to reveal the mass of the world — using both measures, the planet’s density can be derived. While their origin, so far, is a mystery, perhaps this strange class of explanets should be called “Icarus Worlds,” as, like in Greek mythology, they are flying too close to their suns; a cosmic dance that will ultimately lead to their demise. Exoplanet hunters had another mystery on their hands in 2013: a gas giant, HD 106906b, 11 times the size of Jupiter with a peculiar orbit. Unlike Kepler-78b, which is very close to its parent star, HD 106906b is 650 AU (astronomical unit) -- the measure of the distance between the Earth and the sun -- away from its parent star. Astronomers have discovered an exoplanet that is unlike anything in our own Solar System. HD 106906 b has 11 times the mass of Jupiter and orbits its star at 650 times the average Earth-Sun distance. An international team of astronomers, led by a University of Arizona graduate student, has discovered the most distantly orbiting planet found to date around a single, sun-like star. It is the first exoplanet – a planet outside of our solar system – discovered at the UA. Weighing in at 11 times Jupiter’s mass and orbiting its star at 650 times the average Earth-Sun distance, planet HD 106906 b is unlike anything in our own Solar System and throws a wrench in planet formation theories. “This system is especially fascinating because no model of either planet or star formation fully explains what we see,” said Vanessa Bailey, who led the research. Bailey is a fifth-year graduate student in the UA’s Department of Astronomy. It is thought that planets close to their stars, like Earth, coalesce from small asteroid-like bodies born in the primordial disk of dust and gas that surrounds a forming star. However, this process acts too slowly to grow giant planets far from their star. Another proposed mechanism is that giant planets can form from a fast, direct collapse of disk material. 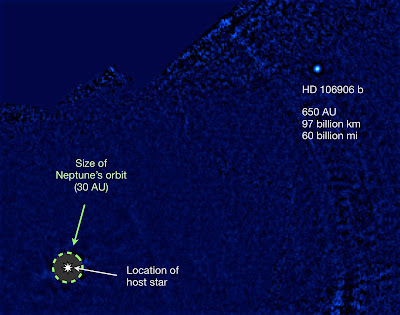 However, primordial disks rarely contain enough mass in their outer reaches to allow a planet like HD 106906 b to form. Several alternative hypotheses have been put forward, including formation like a mini binary star system. According to Bailey, one problem with this scenario is that the mass ratio of the two stars in a binary system is typically no more than 10-to-1. This system is also of particular interest because researchers can still detect the remnant “debris disk” of material left over from planet and star formation. At only 13 million years old, this young planet still glows from the residual heat of its formation. 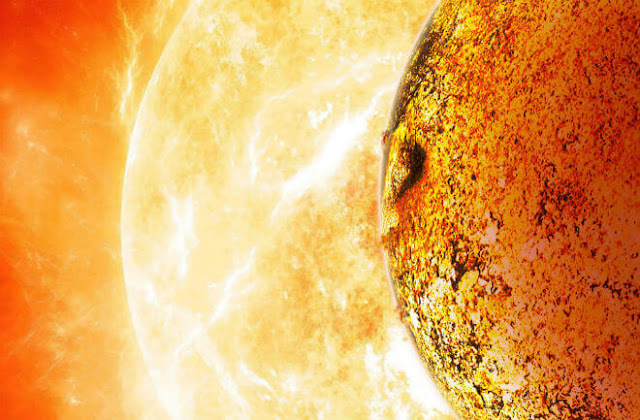 Because at 2,700 Fahrenheit (about 1,500 degrees Celsius) the planet is much cooler than its host star, it emits most of its energy as infrared rather than visible light. Earth, by comparison, formed 4.5 billion years ago and is thus about 350 times older than HD 106906 b. Direct imaging observations require exquisitely sharp images, akin to those delivered by the Hubble Space Telescope. To reach this resolution from the ground requires a technology called Adaptive Optics, or AO. The team used the new Magellan Adaptive Optics (MagAO) system and Clio2 thermal infrared camera – both technologies developed at the UA – mounted on the 6.5 meter-diameter Magellan telescope in the Atacama Desert in Chile to take the discovery image. 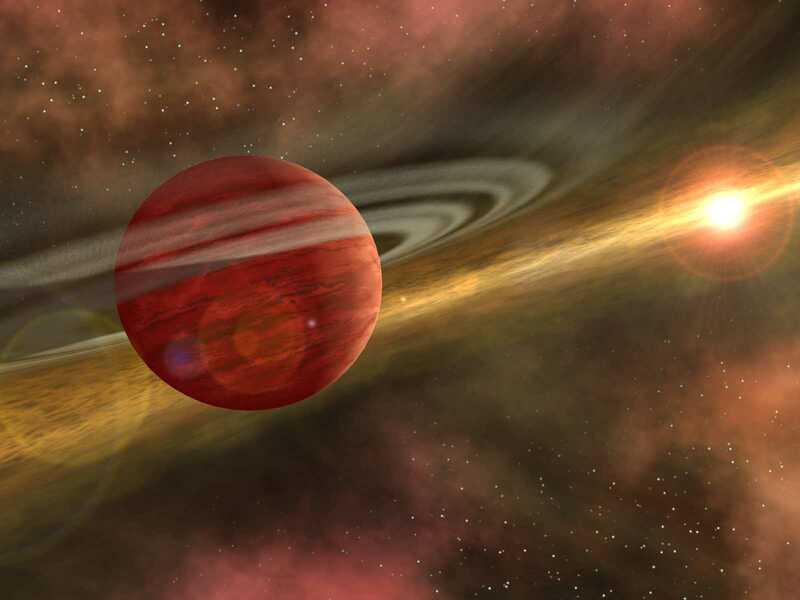 “Clio was optimized for thermal infrared wavelengths, where giant planets are brightest compared to their host stars, meaning planets are most easily imaged at these wavelengths,” explained UA astronomy professor and Clio principal investigator Philip Hinz, who directs the UA Center for Astronomical Adaptive Optics. 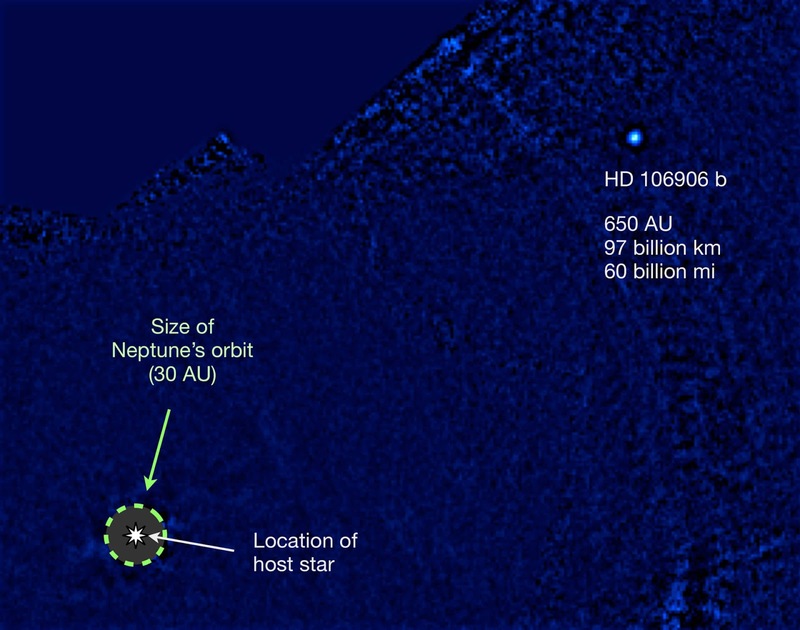 The research paper, “HD 106906 b: A Planetary-mass Companion Outside a Massive Debris Disk,” has been accepted for publication in The Astrophysical Journal Letters and will appear in a future issue. MagAO’s development was funded by the National Science Foundation’s Major Research Instrumentation program, and its Telescope System Instrumentation Program and an Advanced Technologies and Instrumentation Award.